The Massachusetts Basic Firearms Class is a 4 hour class required for you obtain your MA LTC (License toCarry) Class A or MA FID Card in the state. 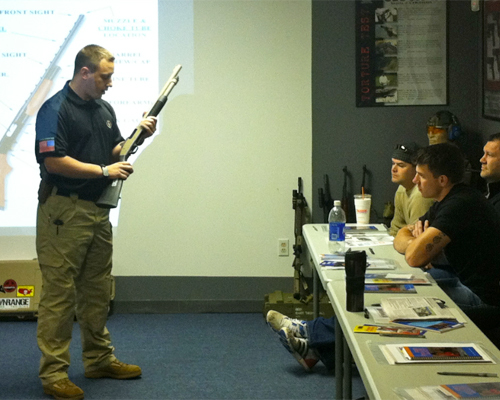 The LTC A is your Firearm License in Massachusetts, and a License to Carry in Massachusetts. This 4 hour course will give you the skills, knowledge and attitude needed to become a competent gun owner and CCW holder. You will learn the loading, unloading and safe handling of a multitude of different handguns, rifles, and shotguns. You will learn proper grip, stance, sight alignment and all the responsibilities that will prepare you for owning and carrying your own firearm. This is a hands on class room, with plenty of student and instructor interaction. You will also be taught the principles of MA laws regarding safe storage and use of your firearms within the Commonwealth. Upon successfully completing this course students will receive a diploma from the NRA in Home Firearm Safety (LTC-007) and a Mass State Police approved Firearms Safety Certificate. *Upon completion of this course students will also receive a coupon for a discounted rate on the purchase of their first firearm, as well as discounts for future courses offered by DRFT.